We’ve seen what looks like the first ad for the Nokia 800 just yesterday, and now we have even more evidence confirming that the Nokia 800 is indeed the Windows Phone handset we’ve been hearing about. 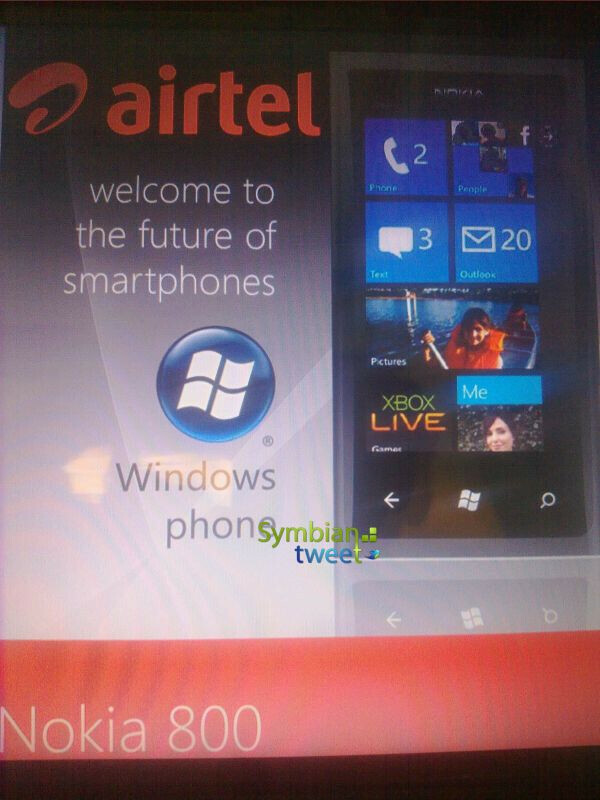 Indian carrier Airtel is advertizing it and the looks of the Nokia 800 mimic the ones of MeeGo-running Nokia N9. Of course, the back, Windows and magnifying glass search buttons have been added to match the realities of Windows Phone, but except for that the 800 keeps the pillow-shaped form of the N9. The rumored spec sheet of the Nokia 800 includes a 3.7-inch AMOLED display with a WVGA resolution (480 x 800 pixels). Under the hood, a 1.4GHz CPU makes Windows Phone tick. Even though it has one of the first ads for the upcoming handset, the Indian carrier Airtel won’t be getting the smartphone until Q1 2012. For the rest - we’ll have to wait just a couple of more weeks as Nokia World on October 26th is expected to finally give us some clarity on what Nokia has been up to in the lengthy transitional months since February. I don't get it, in what way is it a good idea for Nokia to switch to WP7? All Wp7 are pretty much the same, and you will need really good hardware to get yours noticed. Nokia isnt getting a good start. It might be a step up from Symbian, it might not, but I think it should make android phones. Anyways, this phone has typical specs for a wp7 and the only reason it might sell is because the fact that it's from Nokia. Nokia is Exclusive partner with WP7 and Nokia would always be the first one to feature the latest and best features of WP7 and then anyone else can feature those phone features in theirs like HTC & SAMSUNG! And Nokia will get the Updates before anyother organization. Thus Exclusive! It is not the first to get mango? Anyways, that's still not much(Nokia getting updates before others) But thanks for explaining why they went with wp7, I did not know they were "exclusive partners". All I have to say is no s**t... They are alike in most ways. They differ in so little ways, there is no way to make them unique in the software, and as I said "other than hardware" so why are you saying they differ in screen sizes and stuff? Can't you read english numbnutt?, I already said they each have unique software. And how exactly is android unique in software its just like a clone of ios oh wow i can have a background wallpaper... Lame. Androids differ in little ways software wise.. Actually no wait they are all stupidly fragmented. That's the reason why WP7 just works!! !....MS don't let the manufacturers to put too many stuff on the software that would make it buggy. That ads fake, it uses the old windows phone logo, the mango one is a square to fit int with the metro ui. 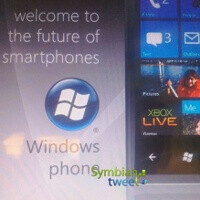 I, personally, would love to have a WP7 device. I didn't grab one, simply because the screen on the HTC Arrive is too small, and I don't like keyboards. So I got the Epic Touch. I love this phone, but if a bigger screen, all touch Mango WP7 comes to Sprint, I'm most definitely jumping ship. The iPhone is completely out of the question lol.